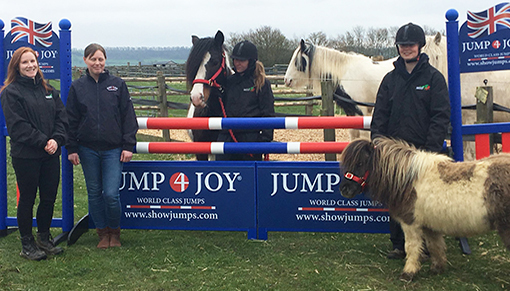 We’d like to say a big thank you to manufacturer Jump 4 Joy who have donated brand-new jumps to our rehoming centres! The company, which has chosen Redwings as their charity of the year, personally delivered a set of jumps to our Oxhill visitor centre in Warwickshire, where a new rehoming centre is currently being constructed. It was the perfect opportunity for them to catch-up with Adoption Stars Rumpel and Wensley, who Jump 4 Joy also sponsor. The pair were very happy to give their seal of approval! New jump sets were also donated to our rehoming centre at our headquarters in Norfolk, and our Caldecott visitor centre, also in Norfolk, where another new rehoming centre is nearing completion. Rachel Angell, Rehoming and Operations Manager, said: “These jumps are a fantastic boost for our teams! They will make wonderful training aids for our horses and ponies, especially those currently undertaking training to be ridden. For more information about our rehoming scheme and the rescued horses currently looking for loving new homes, click here.